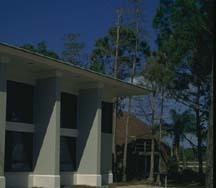 The new provisional Meeting Hall for the Unitarian Universalist Congregation of Greater Naples is located in semi-rural section of Southwest Florida, along Interstate 75, between upscale subdivisions and heavily wooded estate properties. The established congregation is seasonal, generally affluent, well educated, and quite liberal. The congregation had outgrown its existing facilities, consisting of two well-used geodesic domes which had to remain in operation during the construction of the new building. The two geodesic domes were originally constructed inexpensively using wood and residential components (which did not last), and the congregation wanted a more permanent facility, with a/c. The new Master Plan was restricted by government planners when they insisted access to the site could made only from the north end of the site, requiring a long entrance drive. This begins the promenade along a long curved driveway between the forest and a canal, leading visitors to the new Hall. Although the driveways are paved, most of the parking is on grass. The building is situated on the site to face due north from the Hall, towards a densely wooded area. 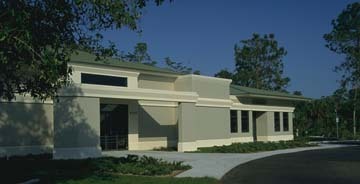 The new building has large covered entrance and patio areas, and deep roof overhangs. All occupied rooms have doors to the exterior and large expanses of double-glazed operable windows for both natural ventilation and a view of nature. The spaces inside and outside provide rooms for meditation, prayer, fellowship, debate, and growth. The multi-purpose provisional Meeting Hall is designed for flexibility, suitable for use as a worship space for services and prayer, and also as a fellowship hall suitable for dinner meetings, congregational meetings, receptions, music recitals, and other performing arts events. The focal point of the Hall is a platform, suitable for use by the Minister, Choir, Performers, or as a platform for a head table, speakers chairs, or projection screen. The adjacent Conference Room has sliding glass doors towards the Meeting Hall, and can be used for smaller meetings, private dinners, as a cry room, or as a banquet area setup as a buffet with a long countertop and pass-thru opening to a well-equipped commercial Kitchen. The building also contains a Nursery, 2 Classrooms for Religious Education, a large Administrative Office, a private Office for the Minister, and separate patio areas finished with natural green slate. This page was last updated June 8, 1998.